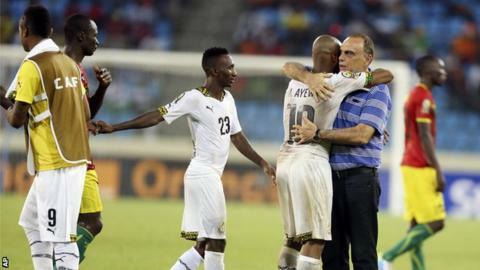 Ghana manager Avram Grant said his team were improving with each match as they reached the semi-finals of the Africa Cup of Nations by beating Guinea 3-0. The Black Stars lost their opening group match to Senegal but won their next two games against Algeria and South Africa to reach the last eight. "Every game we are better than the game before. There were many chances and we scored beautiful goals," said Grant. "We showed a lot of quality today, and that's important for this team." Chelsea's Christian Atsu, who scored twice, agreed with his manager and said: "We went for the win and we worked hard for it, not because Guinea are a bad team." The victory continued Ghana's run of reaching the last four in every tournament since 2006 and they now take on hosts Equatorial Guinea in the second semi-final on Thursday. Guinea coach Michel Dussuyer was full of praise for Grant's side, saying: "Ghana has potential difference-makers, if we make mistakes, we can't advance. "If you consider the first goal, then the second, just before half-time, it becomes near-impossible to come back. "We complicated the match with that goal right at the beginning, there was an immediate loss of confidence, then the gift, things become very complicated against a talented team like Ghana."